Type of site: Non-Profit web site. 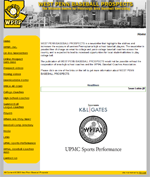 Built around a content management system this site is for high school baseball prospects for players in Western Pennsylvania. Services provided: Conversion of site from Coldfusion to ASP and SQL server. Added capability for users to upload videos that automatically are converted to FLASH video. Hosting: Site is hosted on Amixa equipment.